A housed herd of 132 Jersey cows used in the study. Note nearly all cows are either standing to eat, or lying down in cubicles. There are very few “loafing” cows, or cows stood in cubicles viagra generique pas. See Time Budget for actual results. One of the four success factors for healthy feet is to have low forces on the feet. This includes having good cow comfort, thus increasing lying times, and good cow flow, thereby reducing shearing forces on the hoof. The Healthy Feet Programme farm assessment includes an appraisal of cow comfort, walking surfaces, time budgets and stockmanship. Mobility mentors will understand some of the practical difficulties of this – particularly when time is limited. However, many mentors have commented how valuable they have found this opportunity to spend time “behind the scenes” on their clients’ farms, and the surprising information that such investigations have uncovered that can have a profound effect on a herd’s overall mobility. Video or time lapse photography can be a useful tool to learn more about cow behaviour on farms, and as digital photography becomes easier, this method is increasingly popular. Results can be very engaging too, as they are visual, and footage of cows in a collecting yard, for example, can be very useful for farm workers who might otherwise be unaware of how their own behaviour affects cow flow and standing times. I presented results of a detailed time lapse photography study in a housed herd at last years’s BCVA conference, and share some of the findings here. The study included establishing a detailed timeline of one housed dairy cow over a 24 hour period in a Jersey herd milked through robots. The length of time of each behaviour – such as eating, lying, grooming and loafing – was recorded as well as the number of bouts. The results from this small study contribute to our assumptions and understanding about cow behaviour. 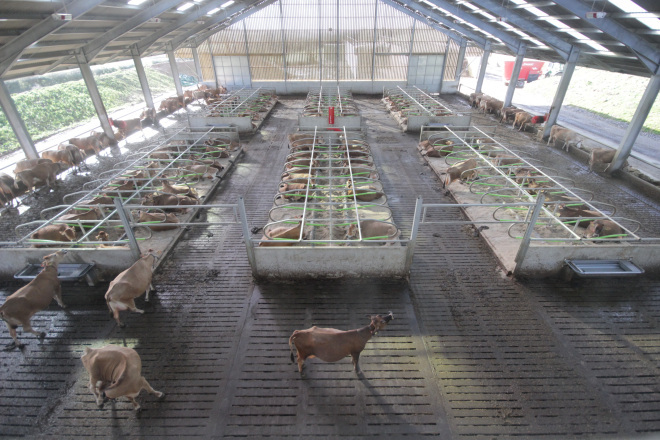 The housing involved in the study was particularly well designed, and the behaviour displayed by the cows might not be typical of housed cows in the UK. The overall lying time was over 12 hours, and consisted of 6 separate bouts. The feeding behaviour was also good, with 9 separate bouts, totalling 5 hours in a 24 hour period. A particular feature of the shed was the amount of space available per cow: 9.7m², which is greater than most farms which house larger Holsteins. An interesting finding from the footage was the amount of time cows spent socialising and establishing their pecking order using head-to-head behaviour, as well as grooming.